For the German plan, see Schlieffen Plan. From 1874–1880, General Raymond Adolphe Séré de Rivières (20 May 1815 – 16 February 1895) oversaw the construction of the Séré de Rivières system, a line of fortresses 65 km (40 mi) long from Belfort to Épinal and another line of similar length from Toul to Verdun, about 40 km (25 mi) back from the frontier. 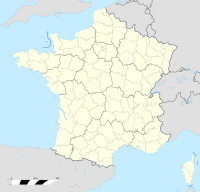 The River Meuse flows northwards from Toul to Verdun, Mézières and Givet on the Belgian border and a tributary of the Moselle between Belfort and Épinal, near parallel to the 1871–1919 French-German border. The Trouée de Charmes (Charmes Gap), 70 km (43 mi) wide, between Épinal and Toul was left unfortified and the fortified city of Nancy was to the east, 12 km (7.5 mi) from the German frontier. A second series of fortifications, to prevent the main line being outflanked was built in the south, from Langres to Dijon and in the north from La Fère to Rheims and from Valenciennes to Maubeuge, although for financial reasons these defences were not complete in 1914. During the 1870s, the French army drew up concentration plans according to a defensive strategy, which exploited the Meuse and branches of the Moselle parallel to the 1871 border. The completion of the fortress lines between Belfort and Verdun in the late 1880s and railway building from the interior to the border, then gave the French army the means to contemplate a defensive-offensive strategy, in which a German attack would be repulsed and then followed up by a counter-attack. In August 1891, Plan XI was completed, with an option for an offensive as well as a defensive strategy from the start, to exploit the opportunity created by the improvement in relations between the Third Republic and the Russian Empire. The Franco-Russian Alliance (1892–1917) led to Plan XII in February 1892, in which an immediate invasion of Germany was considered possible but from Plan XI to Plan XVI, the main strategy remained defensive-offensive, French attacks being expected after the repulse of a German invasion. In 1888, the French began to study a possible German offensive north of Verdun or through Belgium and Plan XII was written with a contingency for a German breach of Belgian neutrality. In 1904, this was given more attention after a German (Le vengeur [The Avenger]) sold a copy of the German concentration plan to French intelligence and described mobilisation methods and war plans. Using this windfall and other sources of information, the French adapted Plan XV of 1906, to be ready for a German invasion of Belgium and later plans contained increases in the forces to be assembled to the north and north-east of Verdun. Plan XVI of March 1909, anticipated a German enveloping manoeuvre through Luxembourg and Belgium, after the findings of a 1908 analysis by General Henri de Lacroix, in which he dwelt on the German preference for enveloping manoeuvres and predicted that two German armies would march through eastern Belgium, around the northern flank of the French fortress zone, one to emerge from the Ardennes at Verdun and the other at Sedan. Lacroix wanted to improve the prospects of the usual defensive-offensive strategy by assembling a new Sixth Army near Châlons-sur-Marne, (now Châlons-en-Champagne), 80 km (50 mi) west of Verdun, easily to move towards Toul in the centre, Verdun on the left or to the vicinity of Sedan and Mézières behind the northern flank. General Victor-Constant Michel, Vice-President of the Conseil supérieur de la guerre in 1910, was more convinced than Lacrois of a German move through Belgium, because of the obstacle of French defences in Lorraine, the terrain in eastern Belgium and German railway building. Michel thought that the Germans would make their main effort in central Belgium and that covering a longer front would need the organisation of French reserve units and integration with the active army. The council rejected his view in 1911, which caused Michel to resign as he considered that deployment from Belfort to Mézières and an offensive towards Antwerp, Brussels and Namur as the only possible way to respond. 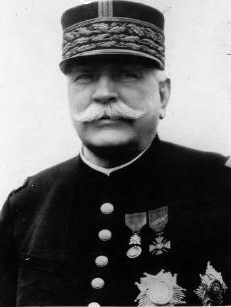 Joseph Joffre was eventually appointed and the functions of Vice-President of the Council and Chief of Staff of the army were combined. In October 1911, a strategic assessment was delivered as part of a comprehensive review conducted from 1911–1912. Joffre had rewritten Plan XVI by 6 September, increasing the number of troops on the Belgian frontier (although not by as much as Michel had advocated), by shifting forces from the Italian border and incorporating second line and reserve units into the front line. The Fifth Army was to assemble further left to Mézières and the Sixth Army was to move closer to Verdun and the Belgian border west of Luxembourg. The amended version of Plan XVI put seven corps close to Belgium, which guarded against a German advance around Verdun or as far as Verdun or Mézières and Joffre increased emphasis on an immediate offensive. Joffre continued to work on the plan and the possibility of a German move through Belgium, in which three alternatives were inferred, that the Germans would respect Belgian and Luxembourgeois neutrality and attack the Belfort–Épinal and Toul–Verdun lines or advance through Luxembourg in the vicinity of Verdun, then make a smaller attack into Belgium or defend in Lorraine and attack through Belgium. The third possibility was considered likely, because the French knew that a recent German war game had used the German fortifications around Metz and Thionville. German improvements to the fortifications at Metz and Thionville, led Joffre to believe that the Germans certainly would attack through Belgium and also that Belgium was the only place where France could fight a decisive battle against Germany. and that to achieve this, the French armies were to concentrate, ready to attack either side of Metz–Thionville or north into Belgium, in the direction of Arlon and Neufchâteau. An alternative concentration area for the Fourth and Fifth armies was specified, in case the Germans advanced through Luxembourg and Belgium but an enveloping attack west of the Meuse was not anticipated; the gap between the Fifth Army and the North Sea was covered by Territorial units and obsolete fortresses. When Germany declared war, France began the execution of Plan XVII with five initiatives, now known as the Battle of the Frontiers. The German deployment plan, Aufmarsch II, included a concentration of German forces (less 20 percent to defend Prussia and the German coast) on the German–Belgian border. The force was used to execute an offensive into Belgium, to force a decisive battle with the French army, beyond the fortified Franco-German border. 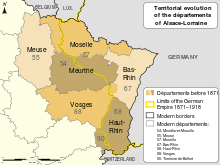 Plan XVII was implemented as an offensive into Alsace-Lorraine and Belgium. The French attack into Alsace-Lorraine resulted in worse losses than anticipated, because artillery-infantry co-operation that French doctrine (despite its embrace of the "spirit of the offensive") provided for, proved insufficient. The attacks of the French forces in southern Belgium were conducted with negligible reconnaissance or artillery support and were repulsed, without preventing the western manoeuvre of the northern German armies. The reality was that many of the French casualties were said to have come from an excess of offensive vigour and on 23 August, General Pierre Ruffey concluded that the infantry had attacked without artillery preparation or supporting-fire during the battle. 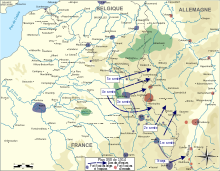 Early on 24 August, Joffre ordered a withdrawal to a line from Verdun to Mézières and Maubeuge and began to transfer troops from the east, opposite the German border, to the western flank. The French armies were to destroy railway facilities and inflict as many casualties as possible on the German armies while retreating, preparatory to resuming the offensive. Two strategic alternatives were possible, to attack the eastern flank of the 1st Army or to envelop the western flank of all the German armies. On 25 August, Joffre issued General Instruction No. 2, for a withdrawal to a line from Verdun to Reims and Amiens and the assembly of two corps and four reserve divisions near Amiens, to carry out the envelopment operation. Joffre called for much greater integration of the infantry and artillery and for more tactical dispersal of infantry to nullify German fire power. In The World Crisis (1923–1931), Winston Churchill used data from French 1920 parliamentary records for French casualties from 5 August to 5 September 1914, which recorded 329,000 killed, wounded and missing. Churchill gave German casualties from August to November as 677,440 and British casualties from August to September of 29,598 men. By the end of August, the French Army had suffered 75,000 dead, of whom 27,000 had been killed on 22 August. French casualties for the first month of the war were 260,000, of which 140,000 occurred during the last four days of the Battle of the Frontiers. In 2009, Herwig recorded German casualties in the 6th Army for August of 34,598, with 11,476 men killed, along with 28,957 more in September, 6,687 of them killed. The 7th Army had 32,054 casualties in August, with 10,328 men killed and 31,887 casualties in September with 10,384 men killed. In the 1st Army in August there were 19,980 casualties including 2,863 men killed and in the 2nd Army 26,222 casualties. In the last ten days of August, the 1st Army had 9,644 casualties and the 2nd Army had losses of 15,693 men. Herwig wrote that the French army did not publish formal casualty lists but that the Official History Les armées françaises dans la grande guerre gave losses of 206,515 men for August and 213,445 for September. ^ a b Doughty 2005, p. 12. ^ Doughty 2005, pp. 12–13. ^ Doughty 2005, pp. 13–14. ^ Doughty 2005, pp. 17–18. ^ a b Doughty 2005, pp. 19–22. ^ Doughty 2005, pp. 22–24. ^ Edmonds 1926, p. 446. ^ Doughty 2005, p. 37. ^ Edmonds 1926, p. 17. ^ Doughty 2005, pp. 55–63, 57–58, 63–68. ^ Zuber 2010, p. 14. ^ Zuber 2010, pp. 154–157. ^ Zuber 2010, pp. 159–167. ^ Zuber 2010, pp. 169–173. ^ Holmes 2014, p. 211. ^ a b Doughty 2005, pp. 71–76. ^ Doughty 2005, p. 71. ^ Doughty 2005, pp. 76–78. ^ Churchill 1938, pp. 1423–1425. ^ Stevenson 2004, p. 54. ^ Herwig 2009, p. 156. ^ Herwig 2009, pp. 217–219, 315. Holmes, T. M. (April 2014). "Absolute Numbers: The Schlieffen Plan as a Critique of German Strategy in 1914". War in History. Thousand Oaks, CA: Sage. 21 (2). ISSN 0968-3445. Kennedy, P. M. (1979). The War Plans of the Great Powers, 1880–1914. London: Allen & Unwin. ISBN 978-0-04-940056-6. Porch, D. (1981). The March to the Marne: The French Army 1871–1914. London: Cambridge University Press. ISBN 978-0-521-54592-1. Ritter, G. (1958). The Schlieffen Plan, Critique of a Myth (PDF). London: O. Wolff. ISBN 978-0-85496-113-9. Retrieved 1 November 2015. Doughty, R. A. (April 2003). "Strategy in 1914: Joffre's Own". The Journal of Military History. Lexington, VA: Society for Military History. 67 (2). ISSN 0899-3718. House, S. J. (2012). 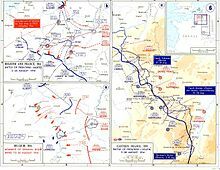 The Battle of the Ardennes 22 August 1914 (PhD). London: King's College London, Department of War Studies. OCLC 855693494. Retrieved 3 November 2015.